It’s a useful tool made of ten practical principles which aims to restore transparent and sincere dialogue based on the noble values of sport to avoid hostile communication in cheering and sport communication. 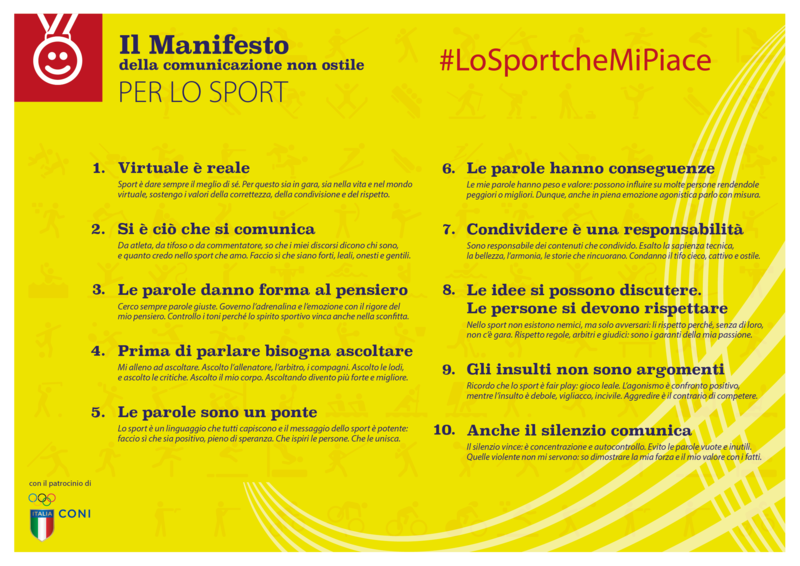 Over 100 athletes, clubs, teams, federations, companies, journalists and communicators involved in the world of sport contributed to apply the Manifesto of Non-hostile Communication to sport. Sport is about always giving the best of yourself. 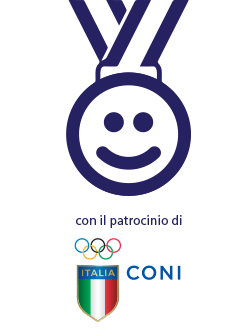 Therefore, I support the values of correctness, sharing and respect, not just during competitions, but also in my daily life and online. The way I speak, either as an athlete, supporter or journalist, represents who I am and shows how much passion I have for sport. Therefore, I make sure my words are strong, loyal, honest and kind. I always look for the right words. I control my emotions through the strength of my mind. I don’t overreact even after a loss, to make sure I always act in the true spirit of the game. I practice listening. I listen to the trainer, the referee, the other players. I listen to praise, and I listen to criticism. I listen to my body. Listening makes me stronger and better. Sport is a universal language and its message is powerful: it’s my job to make it a positive, hopeful message, which inspires people and brings them together. My words are significant and valuable, they could influence a lot of people positively or negatively. Therefore, even when stakes are high, I’m careful with my words. I am responsible for the content I share. I promote technical excellence, beauty, harmony, heart-warming stories. I condemn hostile and harmful antagonism. There are no enemies when it comes to sport, just opponents and I respect them because they are vital to the competition. I respect the rules, the referees and judges as they protect my passion. I never forget that sport means fair play. Practising at a professional level entails positive confrontation, while offences belong to the weak, the vile and the uncivilised. Aggression is the contrary of competition. Silence is a sign of victory, it shows concentration and self-control. I avoid using empty or useless words. I do not need aggressive words, as I know how to show my strength and my value with my actions.